UNC Lineberger Comprehensive Cancer Center and the UNC Institute for Global Health & Infectious Diseases have received a $3.7 million grant from the National Cancer Institute (NCI) to study the growing worldwide cancer problem and expand the University’s efforts in Malawi to study and treat HIV-associated cancers. “Viruses cause 20 to 25 percent of the world’s cancers and this grant will address virally-related cancers in Malawi,” said Blossom Damania, PhD, co-director of UNC Lineberger’s Global Oncology program and assistant dean for research with the UNC School of Medicine. Funded from a newly established NCI grant program, the award will fund the UNC-Malawi Cancer Consortium, a collaborative effort aimed at expanding current efforts in Malawi to address a growing cancer burden. UNC-Chapel Hill is one of only eight institutions in the country to receive this award. HIV and AIDS-associated cancers present treatment challenges for physicians and a serious public health problem in nations with a high incidence of these cancers. Cancers initiated by viruses such as KSHV, EBV and HPV include Kaposi’s sarcoma, non-Hodgkin’s lymphoma and cervical cancer. All are more prevalent in individuals with HIV and AIDS. “While this award is specifically focused on HIV-associated cancers, we anticipate that it will have major catalytic effects on the national cancer control agenda in Malawi, given extremely scarce resources currently to deal with this urgent public health problem,” said Satish Gopal, MD, MPH, director of the UNC Project-Malawi cancer program. This collaboration will begin an ambitious national effort to track epidemiologic relationships between HIV and incidence of lymphoma and Kaposi’s sarcoma in Malawi, in the current era of antiretroviral therapy (ART) scale-up. It will also study the clinical and molecular characteristics of these two diseases with the aim of developing more effective therapy. The grant is based at the UNC Project-Malawi directed by Mina Hosseinipour and Irving Hoffman, the long-term UNC clinical research program established in Malawi in the 1990s. “Working with existing NIH research training infrastructure, we will be collaborating hand-in-hand with partners throughout Malawi to conduct much-needed research to address this growing, global health concern while also fostering the academic careers of our Malawian collaborators and investigators,” said Damania. 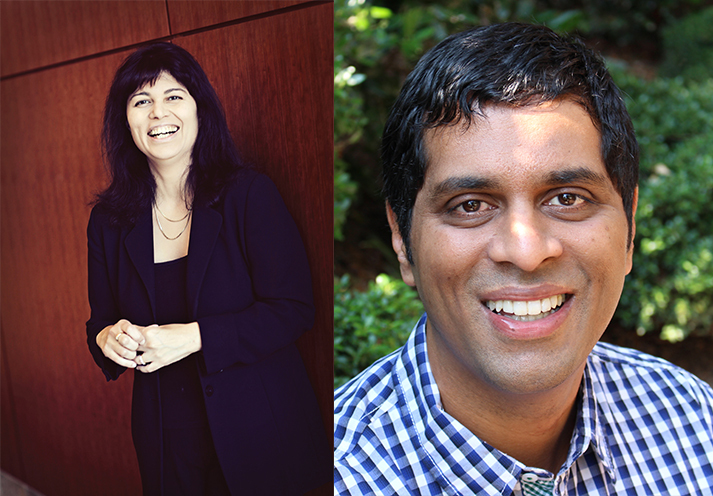 The grant will be led by three investigators – UNC Lineberger members Satish Gopal, Blossom Damania and Sam Phiri, PhD, MSc, executive director of Lighthouse Trust, the largest ART program in Malawi. Other key UNC faculty involved in this work are Dirk Dittmer, PhD, Mina Hosseinipour, MD, Irving Hoffman, PA, MPH, Andy Olshan, PhD, Yuri Fedoriw, MD, and Kristy Richards, MD, PhD. The newly established cancer consortium will build upon a long-standing collaboration between UNC’s Division of Infectious Disease and Malawi’s Ministry of Health. Originally founded to help fight the HIV epidemic, this partnership has expanded to include the provision of cancer care working side-by-side with Malawian partners at one of two national teaching hospitals. In 2011, UNC opened a pathology lab in Kamuzu Central Hospital, making it only the second pathology lab in the entire country. Employing telepathology using digital microscopy, the pathologists in Malawi consult with counterparts at UNC in real-time on a weekly basis. The lab, which has received a 4-star status from the World Health Organization, also provides training and research opportunities for young Malawian health professionals with an interest in cancer. Essential partners for this undertaking include UNC Project-Malawi, the longstanding clinical research site of UNC-CH; the Malawi Ministry of Health (MOH); Lighthouse Trust; Kamuzu Central Hospital (KCH); and University of Malawi College of Medicine (COM) and the NCI AIDS Malignancy Consortium clinical trials cooperative. The UNC-Malawi Cancer Consortium is supported by the University of North Carolina at Chapel Hill through UNC Lineberger Comprehensive Cancer Center (LCCC), the Institute for Global Health and Infectious Diseases (IGHID), and the UNC Center for AIDS Research (CFAR).